Includes dress and boot tops. She is ready to fight against injustice and stand beside Superman for big missions. Supergirl inspires girls with her dashing superhero costumes and super speed. Live your superhero fantasy today while dressed up like a rocking Supergirl. 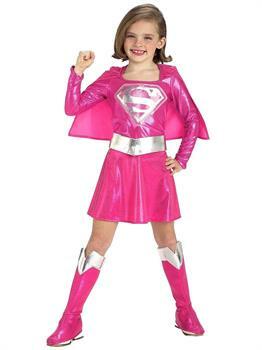 Show your creative mind with Pink Supergirl Toddler/Child costume. I purchased this for Halloween 2015 for my 4yr old (shortly to be 5yr old after Halloween in November) Fits her well.. I ordered a size bigger than she would normally wear. She has room to grow in it and could wear it next yr too if shed like. The one pc costume dress covers the top of her faux boots that are used as a cover and extension over their normal shoes.. So I may hem the dress a bit but other than that I was impressed with the material..very shiny and sparkly! Just what most girls love.